J. P. Metals are the manufacturers of filter wire mesh which is used to manufacture a filter frame , this frame is manufactured by one of our clients who deals in filtration products , this filter mesh is used in cnc machines in the coolant part in order to control the pollution/dirt coming out of the machine during the process of cooling lot of oil & mist emits from the machine in order to stop that pollution our product is used as oil mist control in that particular coolant section. IN automobile industries many products are covered with a thick blanket in order to control the heating of the parts , our knitted wire mesh is used to make such flexible & appropriate blankets which can fit exact on the auto parts. IN large chimneys used in big hotels & restaurants also our filter wire mesh is used in the same way , as the collector of oil & grease coming out of the kitchen area , our filter wire mesh traps the oil & grease emitting from the cooking process in the kitchen & than the dirt comes out from the outlet dish in the chimney for separate collection of the dirt. IN environment pollution control machines also can use our products as the filtration of the waste water , our filter wire mesh helps collect all the dirt & separate the dirt & water which can pass clean from the filter frame. IN aviation industries planes are manufactured with soundproofing system inside the interiors of the plane , knitted wire mesh is required for the purpose of preparing those soundproof sheets , cause of which the sheets remain stiff & can easily be molded as per required structure. 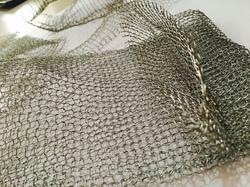 - same features as knitted wire mesh with more surface area which can be required in chemical industries petroleum industries for filtration or separation purpose.